BarnDoor Lighting Outfitters offers a complete line of storage and memory for digital cinema, video and photo applications. Featuring leading brands including SanDisk, G-Technology and Sony and more to come. 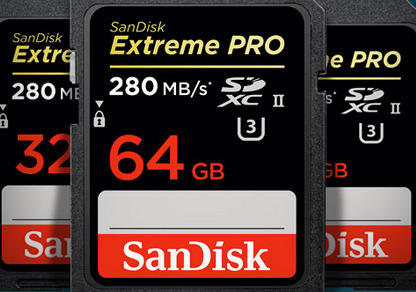 Get super high speed SD memory cards for recording video or fast action photo shoots. Our rugged SSD drives by G-Tech are perfect for the daily rigors on a film set, photo studio, or on location. We have memory cards and memory card readers for every camera. If you don't know which one will be the best for your budget and application, just ask. Get the storage and memory cards with the fastest read / write times in the industry at rock bottom prices. Here at BarnDoor Lighting Outfitters, we don't just sell storage and memory cards, we also use it, test it and research it to help our customers find the appropriate products for every last application. Experience the BarnDoor ... Get More value: fast and free shipping, expert advice and superb customer service. Give us a call at 1-888-276-3667 if you need assistance finding the right products, or send us an email at: info@barndoorlighting.com.